Joel Radio is proud to finally showcase someone who’s been mentioned many times in the past, but has never been a guest – Joel’s ex-girlfriend, comedian and entertainer extraordinaire, Heather Kozlakowski. As she’s making a big move to California to better her career, Heather finally shares her tales of movie acting, radio hosting and comedy. She also talks about what it’s like to date Joel – why does he always look left? – and their unlikely friendship that happened after their break-up. You’ll also hear about her children’s book inspired by Joel, and her open mike arguments with other female comics that were also inspired by Joel! Also, find out Heather’s favorite summer movies, like how Minions is better than Inside Out, why Spy was so good and why she didn’t quite get Mad Max. Plus, Joel on the new season of Big Brother, Penn & Teller: Fool Us returns, the great James Randi documentary, Glen Campbell’s documentary brings the tears, and why Soaked in Bleach doesn’t convince him that Kurt Cobain was murdered. Good luck to Heather from Joel Radio, our loss is the world’s gain! 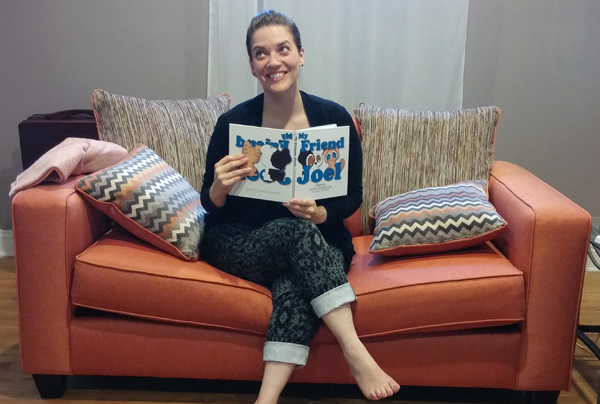 Heather sitting pretty with her children’s book – she’s the cat and Joel’s the dog.